ItemBARK_1990.0003.0187 - Chow Dong Hoy (right) with Joe Hoy, possibly; circa 1910. Item BARK_1990.0003.0187 - Chow Dong Hoy (right) with Joe Hoy, possibly; circa 1910. 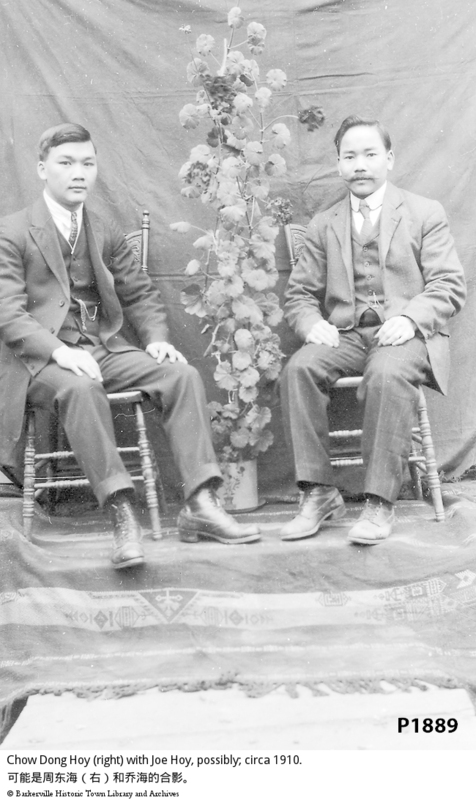 Two Chinese men sitting on kitchen chairs. The man on the right is C.D. Hoy. Both men are in suits and both their jackets are unbuttoned. Between the two men is a large flowering geranium plant. Behind the two men is a plain, dark, creased backdrop. The men are sitting on chairs, on a small stage covered by a designed carpet. Other man is tentatively identified as Joe Hoy.